As a foreign language student, I hardly ever read without a pencil in hand in order to underline important words/phrases which I do not know the precise definition. I then review all of the words once I complete the book. It is a lengthy process, but I figure that the reward is worth it. Needless to say, when I sat down to read the book I chose about Lebanon, habit took over: Reading the prologue, I found myself underlining a couple of words per page. After (somewhat embarrassingly) remembering that my first language was English, I set the book down for about a month before I picked it up again. What was it supposed to be – a SAT vocabulary book? Speaking of the SAT, how I hated that test! My history with the SAT is one that spanned over the course of many years. I was one of the “lucky few” in South Carolina who were selected to take the SAT as a 7th grade student. (I do not mean to brag too much, but I will mention that my 7th grade scores were higher than the state’s average high school senior.) I started re-taking the SAT in the 11th grade. I found an interesting correlation: Every time I re-took the SAT, I became more adept at finding the answers to their questions, resulting in an average 80 point increase each time I took it. My score ultimately depended on how many times I was willing to wake up early on a Saturday morning to take some godforsaken test. Luckily, I am no longer expected to spend my Saturdays filling in bubbles anymore. Instead, I can spend Saturdays doing more interesting things, like reading the books of the Global Book Challenge. 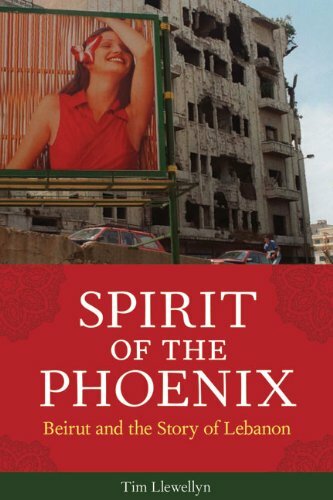 The book I chose to read on Lebanon was Tim Llewellyn’s “Spirit of the Phoenix: Beirut and the Story of Lebanon.” The author, who is a former BBC reporter based in Lebanon’s capital of Beirut for years, shares stories from his past in this book. Not only is the book informative, but has a very personal touch, as the author shares the people whom he had seen and the places where he had visited during Lebanon’s many years of conflict. One of the things that struck me about Lebanon is the importance of its location. Lebanon is located to the north of Israel, making it a key player in the conflict between Israel and the rest of the Arab world. Although Lebanon is a key player, the country itself is unorganized and disjointed. The author describes two forces at play in Lebanon today: Israel and the rest of the Arab world. “’For Israel... the only way to be safe is to be the strongest state in the midst of fragmentation’” (page 82.) In this way, it is implied that Israel wants Lebanon to remain weak and unorganized, so as to appear as the leader in the region and perhaps gain more international support. The author also provides an interview in which it is said, “’For 30 years now the Arabs and Iran have been using Lebanon to fight Israel’” (page 68.) While the author acknowledges this, he also notes, “This is true, but the Lebanese have never been strong or coherent enough to resist outside interference and blandishments” (page 68.) In short, Lebanon is a country caught between competing forces. Lebanon boasts a diverse population, which makes it vulnerable to outside powers wanting to impact international affairs. It has many unique groups of people of different religions living within its boundaries. Once a protectorate of France in the years leading up to World War II, Lebanon was the home to many groups who lived in relative peace, including Sunni and Shiite Muslims and Christians. Also, following the creation of Israel, Lebanon has been the home to many Palestinian refugees. For many years, Lebanon experienced such prosperity that it was considered something along the lines of the Switzerland of the Middle East. 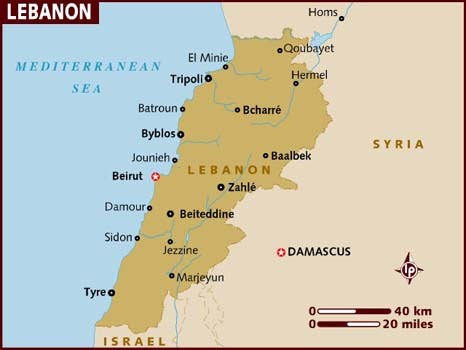 In 1975, Civil War broke out in Lebanon. Lasting fifteen years, it was devastating to the economy. Following the end of the Civil War in 1990, Lebanon has remained unstable. Popular political figures are often assassinated by sectarian fanatics, or by people promoting foreign interests – as was the case with former Lebanese Prime Minister Rafik Hariri in 2005. (Many believe that Syria, Lebanon’s neighbor, was somehow involved in Hariri’s murder.) Tensions in Lebanon are prevalent still to this day. The author ends the book by saying, “As I write, the 18th attempt in six months (since November 2007) to put a new president in place has failed” (page 229.) This inability to work together to accomplish a common goal has doubtlessly taken its toll on the Lebanese people. As I mentioned, the author was a BBC correspondent. I particularly appreciated this when he shared his experience at the Chatila refugee camp (sometimes called the Shatila refugee camp), which is located in the vicinity of Beirut. This refugee camp was the home to the 1982 Shatila Massacre, during which thousands of Lebanese and Palestinian Shiite civilians were slaughtered. I had never heard about this event, but found his account quite moving. As I finish this review, I would like to clear up the matter regarding the SAT-level vocabulary that I mentioned at the beginning. First of all, the author is British. (I know that it is not a good excuse, but I thought I might try it anyway...) Once I restarted the book after having read books about Lebanon's neighbors, I was able to get through the book very quickly. All in all, I recommend this book to anyone interested in learning more about Lebanon, but it is probably best to have some knowledge about the area first.